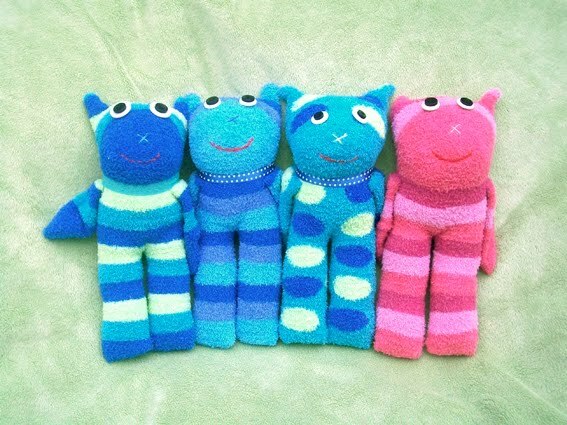 I have been madly making these little sock buddies during the last week... 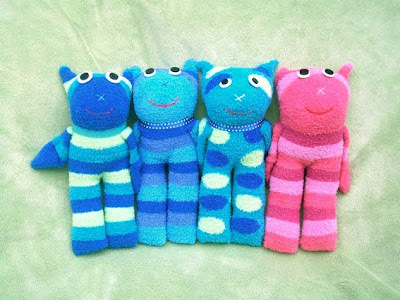 I have made them using a sock, a few buttons, some stuffing and thread. You really have to choose your socks well, some of them are really stretchy and you will end up with a humongous sock buddy. It is also good to choose a sock with a nice coloured pattern (stripes are my favourite) and a coloured heel and toe as they will become the nose and the hands. These socks were lovely and soft so they make cuddly sock buddies (I think they were initially intended to be bedsocks). They were originally designed by kiwi artist and author Vasanti Unka and then slightly adapted by me. Whenever I start something new I automatically start to think in multiples, if I do one, I have to follow it up with another, then another and another... I now have 17 of these little guys. Oh these are so damn cute - love them! I love these cute little fellows! mmm MMM mmm uber cool...! Oh my goodness they are so cute! Love them!